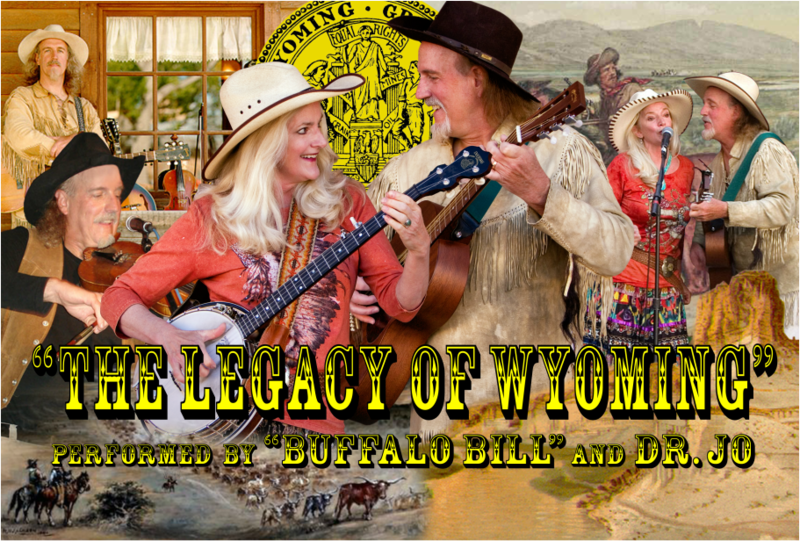 ﻿"The Legacy of the Wyoming"
A live music presentation with exciting Wyoming and Western Songs about, Cowboys, The Oregon Trail, The Transcontinental Railroad, Lewis﻿ and Clark, Stories in Traditional Native American Indian Sign Language, Cowboy Poetry and World-Class Yodeling. ​This Wyoming Music Legacy is accompanied by a multi-media presentation of historical paintings and photographs, taking the listener on an amazing journey of Wyoming History and our proud alluring culture of The Wild American West. "Buffalo Bill" and Dr Jo (Flower of the Prairie) are winners of a Western Music Association Harmony Duo Award. "Buffalo Bill" is a WMA Male Yodeler Award Winner.